This is how I decided to showcase our Christmas Cards this year. 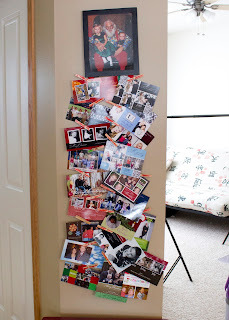 I got this idea from a bloggy friend Kristin, she shared this with me on one of my giveaways. It was such a good idea that I had to try it out. I already had a few frames at home so I went and printed out a Santa print from this year of the girls to go in the frame and I picked up some red and green ribbon. I also picked up clothes pins and had Alex color on them so that I could use those to hang the cards. 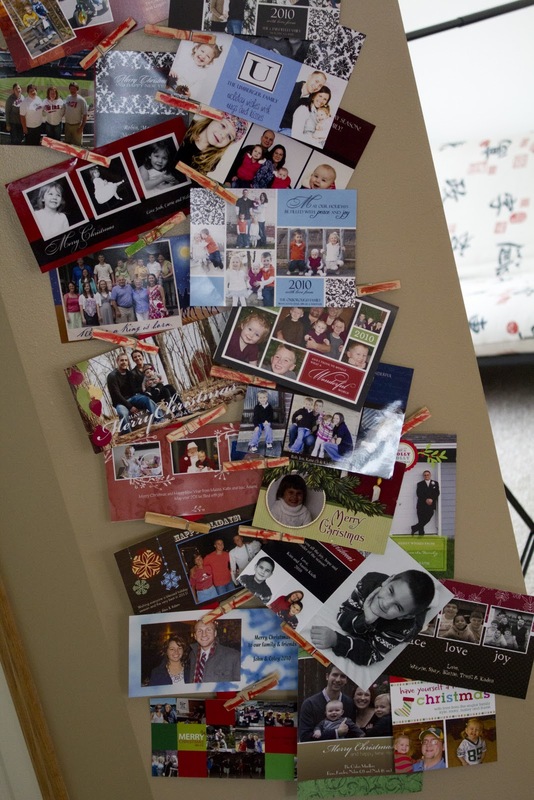 We get a ton of Christmas Cards and I feel like I am still missing a bunch. 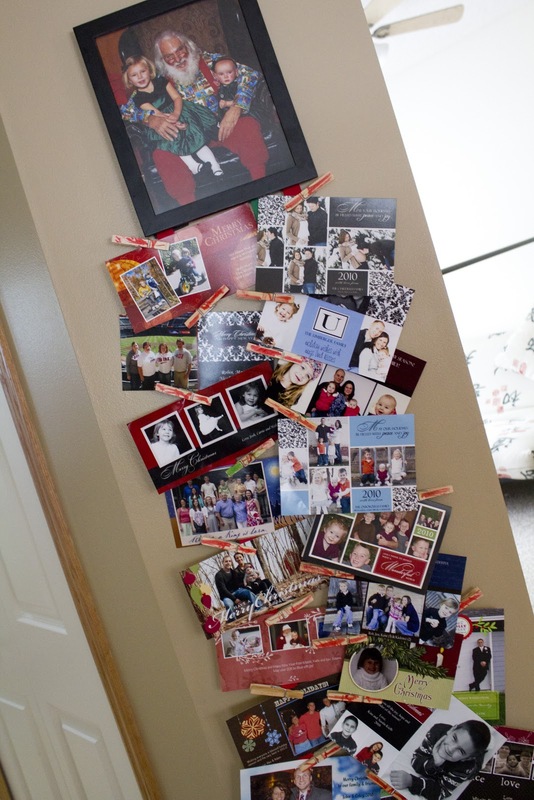 I ask my clients to send me a card if they use an image or images that I took. I love seeing my work on Christmas Cards and seeing what they pick. I spend so much time thinking about Christmas Cards and what card we will use each year that I love seeing what everyone else chooses. All the different combination's and how many pictures people use is always so fun to see. Usually I don't like getting the mail because it is almost only bills but in December it is always fun to get the mail because there is almost always one or more cards in the mail plus packages from and for people! We are starting to get so many cards that they are over lapping and some had to be hung over another. Next year I am going to use a thicker frame that is another size larger and see if I can do another strand of ribbon to make room for more Christmas Cards. How do you display your Christmas Cards!? Do you love getting the mail like me during the month of December. Do you want a Christmas Card from us?! Let me know! I love getting Christmas cards all throughout December. Almost as much as I love getting presents. I wish I could display them all year! 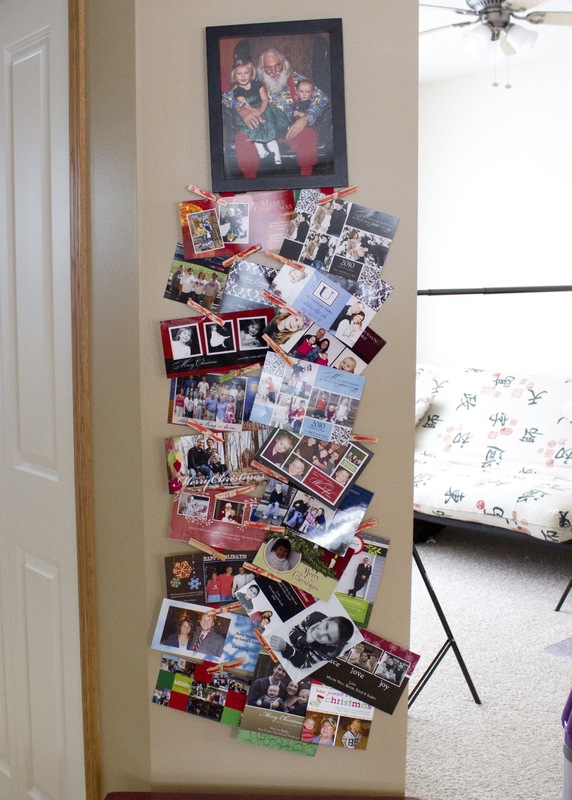 First off... that's a heck of a lot of Christmas cards! You popular girl! :) I like it! I love this idea. I usually put them on the fridge but like you guys they are out of control these days and we get way to many to do that. I put ours up on the piano this year but was trying to find one of those card hangers. I will definitely be doing this next year. Possibly even try to do it this year. That's a great way to display them! 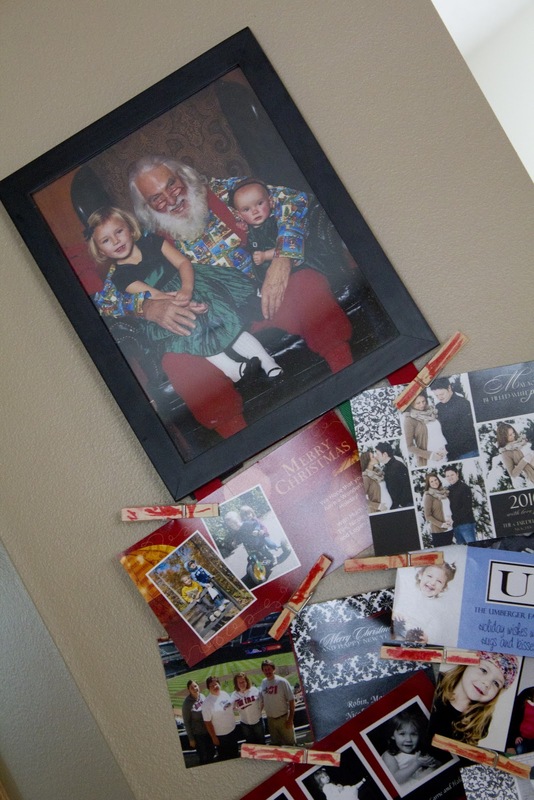 We frame our doorways with the cards! Cute idea! We really haven't received that many Christmas cards this year? It's really strange. I also haven't seen as many Christmas lights either. I'm hoping that you get our card soon. By the way, I love the name of your town. haha! That white rocking chair is wonderful, too! Precious pictures.